FALKIRK held on to runners-up spot in the Championship – but only just. 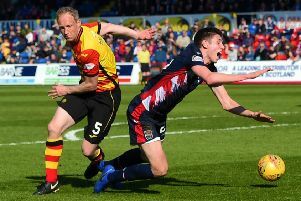 The Bairns have earned an easier route through the play-offs but it wasn’t without a struggle as a spirited Morton side sought the equaliser which would have spoiled the celebrations – and the waste-ground beyond the ground was deemed a good place to hoof the ball. Afterwards, Falkirk manager Peter Houston admitted he was a relieved man when he heard the final whistle. “That was nervy – I wouldn’t like to have to get my pulse tested right now,” he said. “We got the lead but then we stopped playing. We heard what was happening at Easter Road and there was nerves and tension. Credit, too, to his Bairns, though, whom he said had shown “attitude, commitment and desire” to finish as the team with the fewest losses in the Championship, and also to finish above Hibs for the first time in 45 years. Some deeply cynical people had wondered if Morton would be up for this game, the last of a long season for a team in the middle of the table with apparently nothing to play for. In the words of Sam Allardyce, that craggy veteran of the English scene, would they be “on the pop”? Of course, Falkirk fans might have had cynicism of their own regarding how hard managerless Queen of the South would be trying in their match at Easter Road, but Morton had “previous” when it came to astonishing final-day scorelines. Two years ago in the Championship they were absolutely walloped 10-2 at Hamilton. Accies, to have a chance of the title, needed to win by eight goals and duly did. This gave Dundee, playing at the same time, an almighty fright, and although they eventually edged to victory to claim the flag, there was angry talk afterwards about how such a “pub score” needed investigation. The Bairns applied good pressure from the start, long-throw specialist Aaron Muirhead causing panic in the Morton defence, but a Declan McManus cross which almost found Denny Johnstone reminded them to be aware at the back. A strong run and shot, just over, by Robert Barr was another warning and then Stefan McCluskey had a go. The Westfield natives were starting to get restless until Luke Leahy gave them encouragement with a thumping drive. Falkirk had plenty of the ball but Morton’s two banks of four, effective against Hibs the previous week, were again proving tough to crack. A Leahy header from a Muirhead cross which seemed goalbound until it hit Lee Miller on the back added to the home crowd’s frustration but the latter almost made the breakthrough minutes later, his shot from six yards bouncing off the foot of a post before being scrambled away by Derek Gaston. The Morton keeper then had a good stop from a John Baird effort from even closer range and would better it when Falkirk were awarded a penalty in first-half stoppage time. Baird didn’t seem to need any encouragement to go down when tackled by Luca Gasparotto. The striker took a long time to ready himself for the spot-kick only to see Gaston hurl himself to his right to block it. The home fans’ disappointment, however, was short-lived. Pressure from the restart was rewarded when Miller crossed from the left – a teasing one into that stay-or-go area that goalkeepers don’t like – and Paul Watson stooped to head Falkirk into the lead. A minute later the provider almost turned scorer, Gaston saving Miller’s header. Falkirk seemed content to sit on their lead but then word spread round the ground that Hibs had scored, bringing the rivals level on points again, and the jitters of the first half returned – all the more so when Ross Forbes’ free-kick beat the wall and Rogers had to save smartly down at his post. Then Johnstone found himself in glorious space on the edge of the box but the left-foot screamer he’d visualised never materialised. Declan McManus roared through the home defence, possibly with the idea of a left-foot screamer himself, but he blasted the ball high and wide. Hibs had doubled their lead and the groans from the stands were getting louder and more anguished. McManus made a better job of his next chance, rounding Rogers and putting the ball in the net, only to be flagged for offside. Falkirk were really hanging on but Morton’s last chance fell to Alex Samuel who couldn’t quite climb high enough to threaten to spoil Falkirk’s day.